In this post I’ll be writing about a ROP (Return Object Programming) exploit that I had recently developed for a vulnerability I had discovered in an application called “RemoteExec”. The vulnerability is caused when opening a .rec file containing an overly long line triggering a stack-based buffer overflow. It was first published in March 2010 reported in version 4.04 and fixed in version 4.05. Since then a number of later versions have been released. This exploit is being released for educational purposes only. In this exploit I will be taking control via the return address. The exploit below needs no explanation as this should work on any Windows operating system not supporting hardware DEP (data execution prevention). 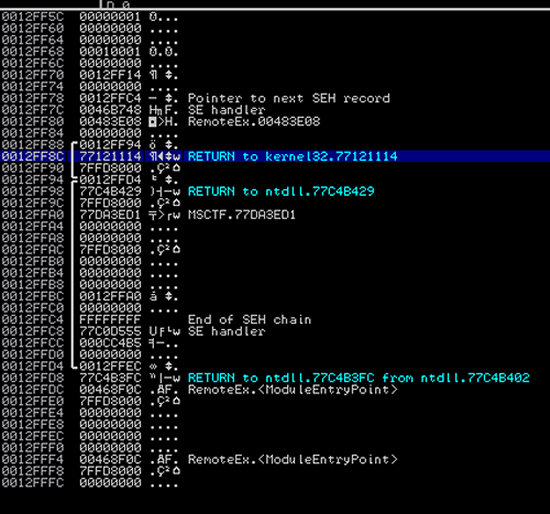 The return address in this case points to instruction ‘push esp # ret’ taken from the RemoteExec.exe executable. To run this exploit on a Windows 7 OS which has ASLR and supports hardware DEP would still work as the return address is taken from the binary itself (RemoteExec.exe) which is not compiled to use ALSR and DEP. 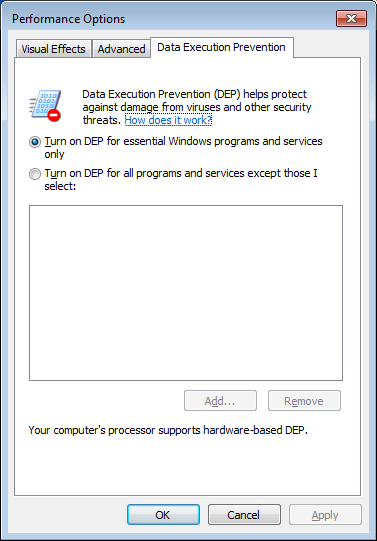 Also by default Windows 7 DEP mode is set to “Optin” which means it only protects essential Windows programs and services. 2. 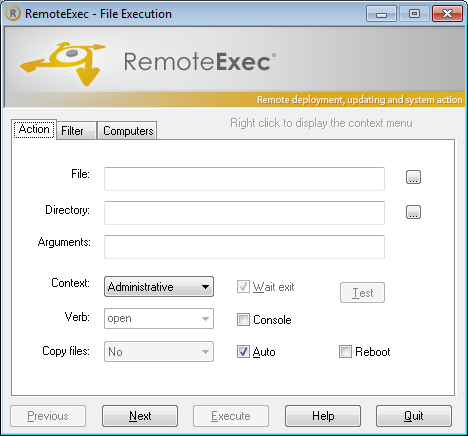 Using all instructions from RemoteExec.exe i.e. ROP gadgets as this binary does not support ASLR. For this exploit I will be using the VirtualProtect API to change the access protection of memory in the calling process and use the PUSHAD technique to push our register values in the stack before calling our API. Our registers will need to contain values required for the VirtualProtect parameters. The values we can place in our registers using ROP gadgets outputted from mona.py script. To call VirtualProtect I was hoping to find a pointer in the IAT (Imported address table) which I viewed using IDA Pro Free but unfortunately was unsuccessful. If I did find a pointer then I would have been able to use this pointer to VirtualProtect as pointers in IAT would be static and would not change. Using the VirtualProtect pointer address from Windows 7 kernel32.dll library would be pretty useless as in the next OS reboot the address would change due to Windows libraries compiled to use ASLR. 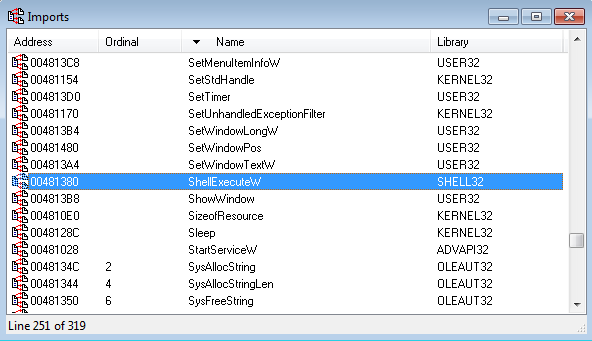 Fortunately looking down the near the bottom of our process stack after setting a breakpoint on our return to stack return address we see a pointer to an address in Kernel32.dll. What we need to do now is to go all the way down using ROP gadgets and copy this pointer value, do some calculations to obtain our VirtualProtect address. In the exploit below I have laid it out on the order how PUSHAD pushes the registers onto the stack. The register value of interest would be ESI which after its ROP chain will end up containing a pointer to VirtualProtect. #  pointer. We need to add 0x151C or 5404 bytes to get to our pointer. #  distance is the same after reboots both for Windows 7 and XP. 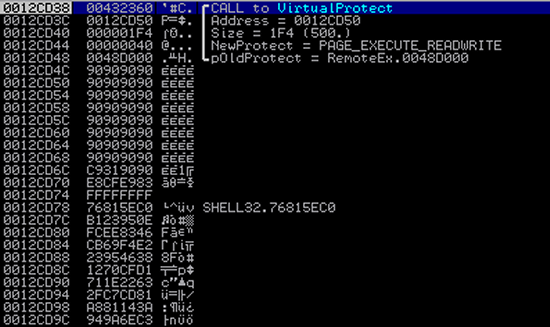 #  boot as the address of VirtualProtect is 0x771150cb in this instance. If we were to run this exploit in Windows XP even though these steps are not required as XP doesn’t support ASLR the distance to our kernel pointer would be the same (5404 bytes) but our distance to VirtualProtect pointer from our kernel pointer would be different so the exploit would fail. For Windows 7 we need to subtract 0xC049 whereas in Windows XP would be 0x155A3. You might be wondering where did I get this magic value of 0xC049? Well even though our kernel pointer and VirtualProtect API values change every time at boot, subtracting them the sum would always be the same. What if we cannot obtain our kernel pointer from the stack? Well we can check all the pointers to API’s in the IAT and see what we can use. One API that stood out for me was ShellExecuteW. This is perfect to use for our code execution. 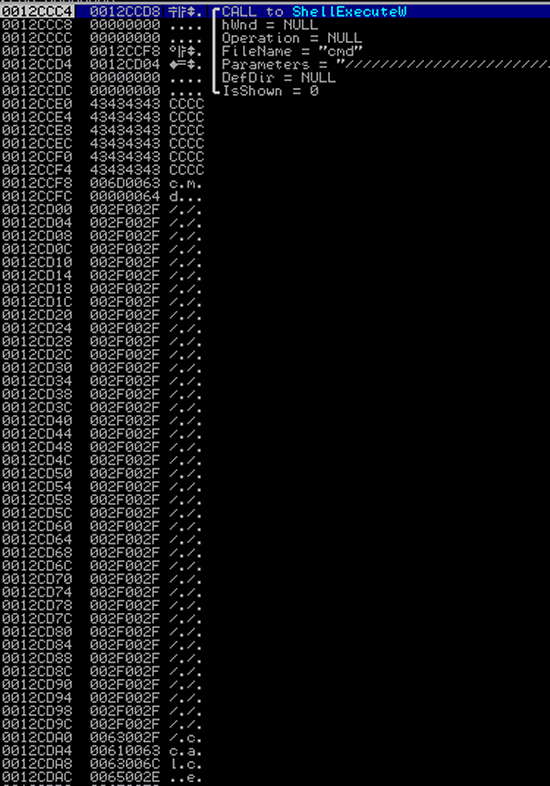 Checking the ShellExecuteW API we can see that most of the parameters can be set to NULL thus writing our ROP exploit that much easier. So when pushing the values in the stack using PUSHAD the only pointers we need to work on are ECX and EAX. ECX will need to point to cmd and EAX to our chained commands. The strings i.e. cmd and our chained commands has to be in unicode as the API we are calling supports unicode only. So our API parameters would look like this below where here we are executing two calculators. The interesting thing in this case is that the offset to “Parameters” parameter is not always precise for Windows XP and Windows 7 so I have used forward slashes which acts as nops so it would look something like this below making it work for both operating systems. I would like to thank to Peter Van Eeckhoutte’s superb tutorial “Chaining DEP with ROP – the Rubik’s[TM] Cube” and the Corelan team for the mona.py script. Without these two materials learning ROP exploitation would have been a lot harder. I recommend reading this tutorial as it explains the theory behind ROP and other techniques that can be used to exploit. Finally when starting to write an exploit always remove any bad characters before anything else as it will save time in the long run. In this exploit the bad characters were ‘\x09\x0a\x0b\x0c\x0d\x1a\x20’ which cannot be used at all in our REC file. If we were only trying to exploit in Windows XP then just calling the VirtualProtect API address would normally work which is 0x7c801ad4 but as you can see in this case it contains 0x1a which would break the exploit. One way to get round this is to place a value not containing 0x1a and do ADD/SUB ROP gadgets to get to VirtualProtect. When you create the ROP chain, some of the addresses you selected and constant values you used to pop into register (such as 0x00000040) contains 00, will the vulnerable program interpret it as String terminator and cuts off your attack vector? Most string functions do but RemoteExec.exe use some other API to parse strings which doesnt terminate when it hits a null therefore in this case 00 is not a bad character. Yes, the API used to read computer names from the .rec file was fscanf(pFile, “%s”, szBuffer) so only an end of line, a space or a tab was ending the string.